THE organising committees don’t reveal figures but it would have been interesting to learn the voting for tonight’s PwC Footballer of the Year ballot. 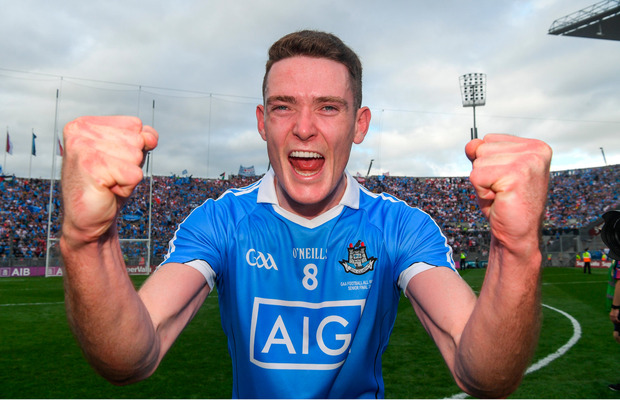 In the end, the inter-county proletariat chose Brian Fenton as this season’s outstanding footballer, presumably by a nose over Dublin team-mates, Ciarán Kilkenny and Jack McCaffrey. Kilkenny was Dublin’s outstanding player in this year’s league and finished the summer as the championship’s top scorer from play with 2-24, an average of more than four points per match, while still excelling in his role as his team’s chief playmaker. McCaffrey was a late-comer to the race having played his first match of the season on June 10th, by which time Fenton and Kilkenny had already collated impressive bodies of individual work. Yet McCaffrey, the 2015 winner, finished with Man of the Match performances in both Dublin’s All-Ireland semi-final victory over Galway and in their final victory over Tyrone. What is not in doubt, however, is the extraordinary level of success Fenton has had in his career to date. Famously, he has yet to lose an inter-county Championship match, having made his debut in 2015 on the first day of Dublin’s four-in-a-row. "It's almost a burden at this stage," he laughs of the record. "Anywhere I go, people mention it to me. It's not something I think of, I'm just fortunate to be part of a special Dublin team. "I'm one of 30 men that plays and that's their record rather than my record. "Yeah, look, it's great, but I've no doubt that time will come. We lost this year in the league and we lose regularly with my club so it's not an unnatural feeling." This year, Fenton not only put up the highest individual scoring tally of any recognised midfielder in the league with 1-9 in seven games, he then went on to set a scoring record for a midfielder in a Championship campaign with 1-13, similarly from seven starts. "I did hear that during the week. It's amazing, I wouldn't have been aware of that at all," Fenton stressed. "That's it, you always just sit down and look at areas where you can improve and every hurler and footballer is the same and every child growing up is the same. "You want to get better on your weak foot or weak hand. I watched back games I played last year and there were probably opportunities where I could have taken a shot. "Not in a selfish way, but the shot was on. "That's something that I tried to work on in the off-season and carry through to the summer. "Luckily, yeah, 1-13, I wasn't counting, but it's a nice little record to have." Figures released by the GAA’s official statistic partner Sure recently show that 0-4 of Fenton’s tally came via his left foot while his 'shot efficiency' was 73.7% (14 scores from 19 attempts). His pass completion for the summer was 95.9% (165 from 172) although remarkably Kilkenny’s was even higher at 97.4% having made just a single unsuccessful pass from 170 attempts. Given Dublin’s inclination to take short, quick kick-outs when available, it is probably no surprise that Fenton won just 13 of his own team’s restarts across championship while he averaged one opposition kick-out per game. His Raheny team mate, Brian Howard meanwhile, lost out to Kerry’s attacking sensation, David Clifford for the Young Footballer of the Year award. Howard was outstanding in both the Dublin half-back and half-forward lines this year yet won his All Star in midfield alongside Fenton. Clifford scored 4-18 – 3-15 of which came from play – and was unanimously Kerry's best player in his first season out of the minor grade in which he sprang to national attention. "That's what makes the evening and the event and the award extra-special, to be named alongside Brian," said Fenton. "As someone who turned 21 this year he's been a credit to himself and our club and his family in the way he's stepped into the role and stayed so mature and humble and grounded. "I just think he's an extraordinary guy and it's great for our little club in Raheny and our little parish to be recognised on the big stage. "I think we're the only club to be represented twice in the All-Star team, you couldn't have dreamt of that at the beginning of the year or even in history,” Fenton concluded.